The Holocaust, Genocide and Mass Violence (HGMV) Interdisciplinary Graduate Group continues to be a thriving community of graduate students, faculty and visiting scholars. This year, we decided to split the time between two speakers, to more accurately reflect presentation lengths in conferences, and to still be able to provide thoughtful feedback. We had a total of 20 presenters – the largest number to date! We started off the year welcoming everyone back from the summer by sharing information about HGMV funding and other professional development opportunities. Our first speaker, Maria Jesus Fernandez, a CHGS visiting scholar, started us off with a fascinating talk on translations of Anne Frank into Spanish. Throughout the year, we were also visited by captivating scholars and educators, such as Jodi Elowitz who led a timely training session on how to teach about right-wing extremism, Carlo Tognato who argued for a civil pedagogy of solidarity for highly polarized societies, and Martha Stroud, who gave an engaging account of the lingering stigma after the 1965 killings in Indonesia, followed by a training session on how to use the Genocide Survivor Testimonies at the USC Shoah Foundation. 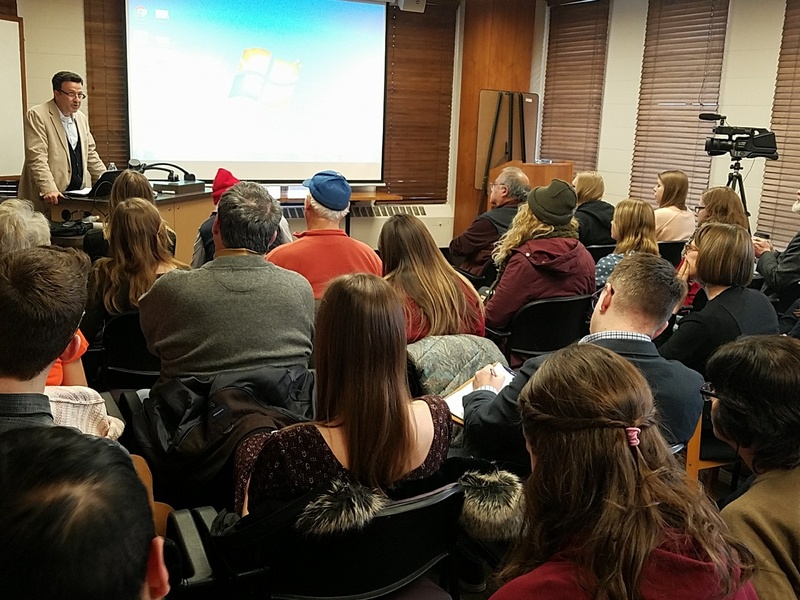 Our student speakers came from 8 different departments throughout the University of Minnesota, and covered a wide range of topics, including Holocaust education, an analysis of Peruvian cinema and the genocide in Indonesia and . Students presented work in various stages, and they deployed a variety of interdisciplinary qualitative and quantitative methodologies. Brooke is from the small town of Chagrin Falls, Ohio. She graduated from The Ohio State University with a double BA in Sociology and Psychology and a minor in Italian. Before beginning graduate school, she worked at the 2015 World’s Fair in Milan, Italy and interned with the Center for the Prevention of Genocide at the United States Holocaust Memorial Museum in Washington, DC. She is now a Sociology PhD student at the University of Minnesota, where she is minoring in Human Rights. Brooke serves as a member of the graduate editorial board for The Society Pages, manages the Genocide Education Outreach (GEO) program, and works for the Center for Holocaust and Genocide Studies. Brooke’s research interests include knowledge, violence, and reconciliation in Africa. Her research seeks to better understand generational trauma in contemporary Rwanda. She completed pre-dissertation research this past summer in Kigali, where she interviewed young Rwandans about their understandings of the 1994 genocide. She is interested in the commemorative process and has conducted ethnographic work at a number of memorial sites and ceremonies. 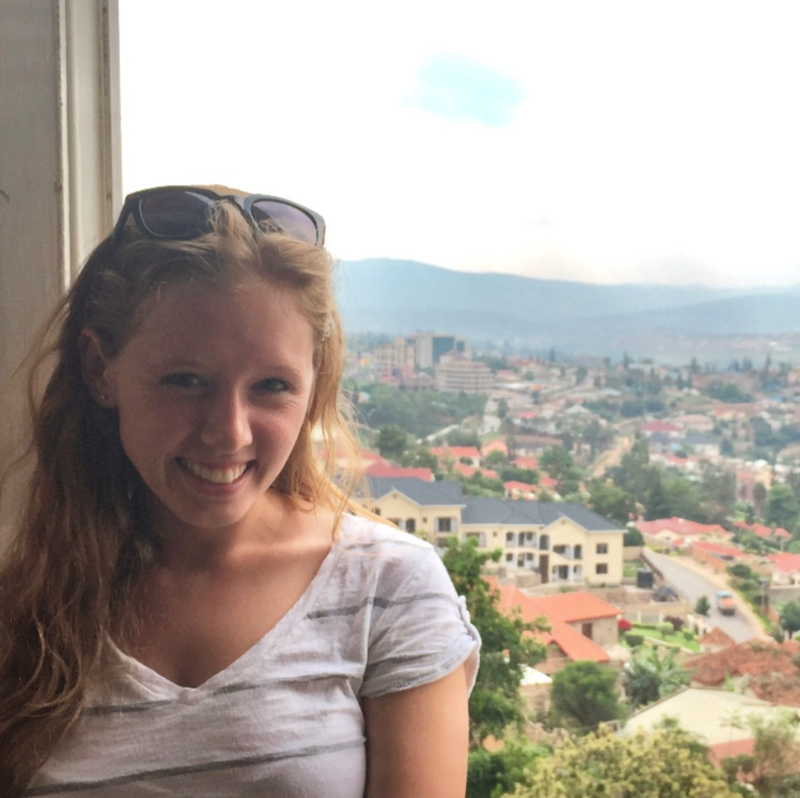 For her research on the Rwandan genocide, Brooke was awarded the prestigious 2018-2019 Bernard and Fern Badzin Fellowship! In addition to her dissertation work, Brooke is involved on projects about denial of the Armenian genocide and the Rwandan gacaca courts. If you have visited Warsaw, Poland, you have seen it majestically rising up from the square, between a Soviet era style apartment complex and the POLIN Museum of the History of Polish Jews. On a sunny afternoon in Warsaw, people sit on benches, read papers, converse and eat lunch; others walk their dogs, or simply stroll along Mordechai Anielewicz Street. The Warsaw Ghetto monument a backdrop to their daily existence, barely noticed. Politicians and dignitaries lay wreaths, and Jewish visitors leave stones and light Yahrzeit candles. For them, it is a memorial, a way to remember those who fought from April 19-May 16, 1943; who chose how they would die when death was the only option. 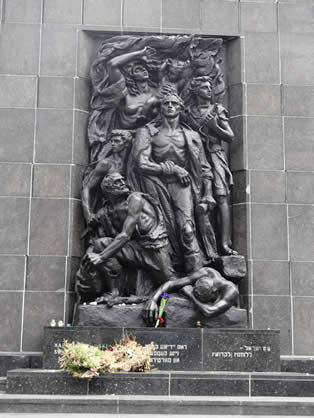 For 70 years, Nathan Rapoport’s Warsaw Ghetto Monument has marked the Uprising, first bursting out from the rubble of the ghetto on the spot linked to leader of the resistance Mordechai Anielewicz’s death. From the rubble, a neighborhood has grown around the monument which now faces the new museum dedicated to educating visitors about the thousand years of Jewish life in Poland. Kentucky recently became the eighth state in the nation (joining a small but growing list of states) to mandate Holocaust and genocide education for all middle and secondary students. The Ann Klein and Fred Gross Holocaust Education Act recently passed the Kentucky General Assembly and was signed into law on April 2nd, 2018. The law states: “Every public middle and high school’s curriculum shall include instruction on the Holocaust and other cases of genocide, as defined by the United Nations Convention on the Prevention and Punishment of the Crime of Genocide, that a court of competent jurisdiction, whether a court in the United States or the International Court of Justice, has determined to have been committed by applying rigorous standards of due process.” While such well-intentioned legislation aims at countering increasing anti-Semitism in the United States and around the world, the bill may well fall short of lawmaker’s intentions in its implementation in classrooms. The legislation makes no provision for supporting the state’s teachers in complying with the law. Further, the law’s language may curb teachers from robust explorations of genocide by limiting permissible case studies. Thursday marks the start of the 37th annual Minneapolis-St. Paul International Film Festival, a two plus week celebration of cinema from across the globe. This year’s events feature more than 250 films spread across six theaters throughout the Twin Cities. Professor Carlo Tognato gave a lecture titled, “Narrating the ‘Righteous in the Colombian Armed Conflict’: A civil pedagogy of solidarity for highly polarized and deeply divided societies” at the Holocaust, Genocide and Mass Violence Interdisciplinary Graduate Group. You can watch the lecture here. After his lecture, Tognato shared more insights with Michael Soto (UMN Graduate Student, Sociology). Carlo Tognato is Associate Professor at the Department of Sociology at the Universidad Nacional in Colombia. He is also Director of the Nicanor Restrepo Santamaría Center for Civil Reconstruction in Bogotá and Faculty Fellow at the Center for Cultural Sociology at Yale University. For over a decade, he worked on cultural economic sociology. Since 2014, though, his research has almost exclusively concentrated on civil reconstruction in postconflict society, thereby taking a more interventive and public turn. In your presentation on “Narrating the ‘Righteous’ in the Colombian Armed Conflict,” you highlighted that post conflict narratives tend to have a binary focus on victims and perpetrators. You introduced a third category, that of the ‘Righteous.’ What does this mean and why is it important? The big problem with the victims-perpetrators binary is that it ends up feeding into extreme polarization and deep socio-political divisions. When you are under these circumstances, and you want to solidarize with a person who belongs to another group, then the people within your own group will see the act of solidarity towards people from other groups as an act of betrayal of in-group solidarity. “A Holocaust video game!” exclaimed the man sitting to my left with an alarmed look on his face. Professor Wulf Kansteiner, in a keynote address, had just suggested both the inevitability and the necessity of such a video game in his argument for expanded tolerance towards the shifting nature of Holocaust narratives in societal consciousness and education. Indeed, half the audience gathered at the three-day Holocaust education conference, “Near but Far: Holocaust Education Revisited,” in Munich, Germany seemed incensed by the idea of a video game about the Holocaust. The other half – a mix of professors, teachers, and site educators – nodded their heads, if not in approval, perhaps knowing that the future of Holocaust education, as outlined by Kansteiner, is already emerging. Indeed, such games are making a tentative foray into an industry whose revenues have surpassed those of the movie industry for more than a decade. On March 24, 85 year old Vel d’Hiv roundup survivor Mireille Knoll was murdered and her body partially burned in her Paris apartment by a Muslim neighbor. Pundits speculate that the neighbor may have been radicalized in jail, although we are still at the very beginning of the investigation. The neighbor knew her since age 7. During the past twenty years her humble apartment remained open to him and to neighbors of all faiths. No one could have anticipated the horrific crime, worthy of Dostoyevsky’s Crime and Punishment–the murder of an old, vulnerable woman, just because it is possible, because after the death of God, man is all powerful. In front of such barbarity, one falls speechless, aware that wording will never do justice to such evil. Language, indeed, and forgive the cliché, is inadequate. The failure of words comes from the failure of theodicy, a word which in Greek means “divine justice.” Man-made atrocities, past a certain degree, can no longer be thought in terms of hidden providence, in terms of making sense of suffering. While Job was tested by God, it would be indecent to explain the torture of Mireille Knoll as God’s and Satan’s plan. French Jewish philosopher Emmanuel Levinas, in an essay written in the wake of the totalitarianisms of the last century, used the phrase “useless suffering.” He meant that after Auschwitz, Hiroshima, and Cambodia, it is no longer possible to believe that suffering has a purpose, that it is God’s plan, or that, if one does not believe in God, it is a necessary evil that will result in historical progress (think of the millions of victims of Stalinism, in the name of a better humanity and of hastening the end of history.) It is no longer possible to believe that negativity, death, and suffering have a hidden purpose. Film, since its inception, has played a significant role in capturing history. It has given us ways to explore events in the past while contemplating the present. Art (it would seem) is ahead of politics, especially in matters of examining the painful realities of World War II in Eastern Europe. In recent years there has been a dangerous trend in Poland and Hungary in revising history to fit a political narrative. Both Poland and Hungary have been trying to balance Democracy and the rise of right wing political parties, who are determined to use the Holocaust to rewrite historical narratives to create nationalistic pride, directly contradicting their past and present. Poland and Hungary along with Ukraine, Lithuania and Latvia, are all experiencing revisionist movements. Historian John Paul Himka believes part of the problem is how these once double occupied countries (by Germany and the Soviet Union) dealt with false historical narratives or “myths” they were told under post-war Soviet occupation, once they were free of Communism. Himka states in their hurry to join the West, they did not take the necessary time and care to explore their wartime roles, allowing for a division between memory and fact.